Environmental justice addresses quality of life with emphasis on cumulative environmental, health, social and economic impacts of spatial toxic threats and toxic hazards. These perils include polluting facilities, deleterious land uses that affect community stability and resiliency, and negative outcomes such as poverty, segregation, higher mortality and morbidity, stress and neighborhood stigma. Since the 1960s, research reveals the disproportionate effects of lead poisoning, dumps, landfills, hazardous waste sites, incinerators, highways, chemical plants, refineries and other industries in communities of color and low wealth communities. 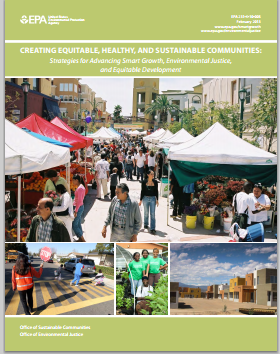 Environmental justice proponents are pursuing sustainable environmental and economic models based upon conservation of natural resources, open space preservation, renewable energy, safe jobs and the tenets of participatory democracy and equal protection under law.